Even your soda bottles can dress up for Halloween whenever you apply one of these Glowing Halloween Slapsticker Soda Bottle Labels! Dress your two-liter bottles in these great looks and you will transform mundane soda into delightfully wicked drinks. Each pack of labels is sold as a set of 4, which ensures that you get one of each clever label. You will get a label for zombies brain juice. You will get a label for black cat brand wicked witch brew. You will get a label for memento mori poison, which is expiration guaranteed. And lastly, you will get a label for nosferatu vampire blood, which is bottled in Transylvania since 1897. And the best part is that each of these labels are designed to glow, both in the dark and when exposed to a blacklight. Each label comes as a sticker so it can be easily applied to any standard sized two-liter bottle of soda. 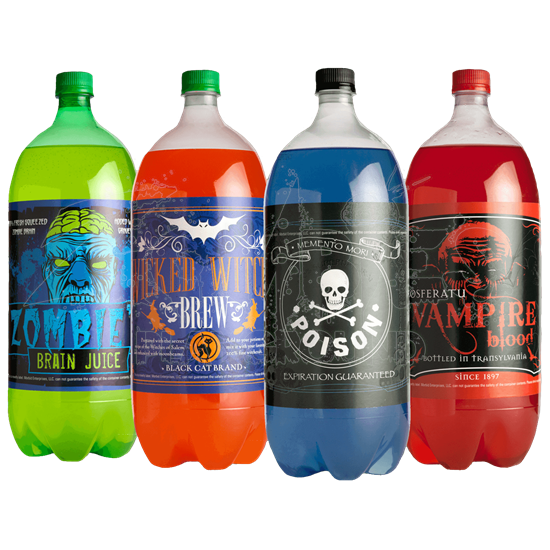 There is absolutely no reason to serve regular soda at Halloween, not when you can apply a few of these Glowing Halloween Slapsticker Soda Bottle Labels and transform your favorite bottle of soda into your new favorite bottle of ghoulish refreshment.